community. 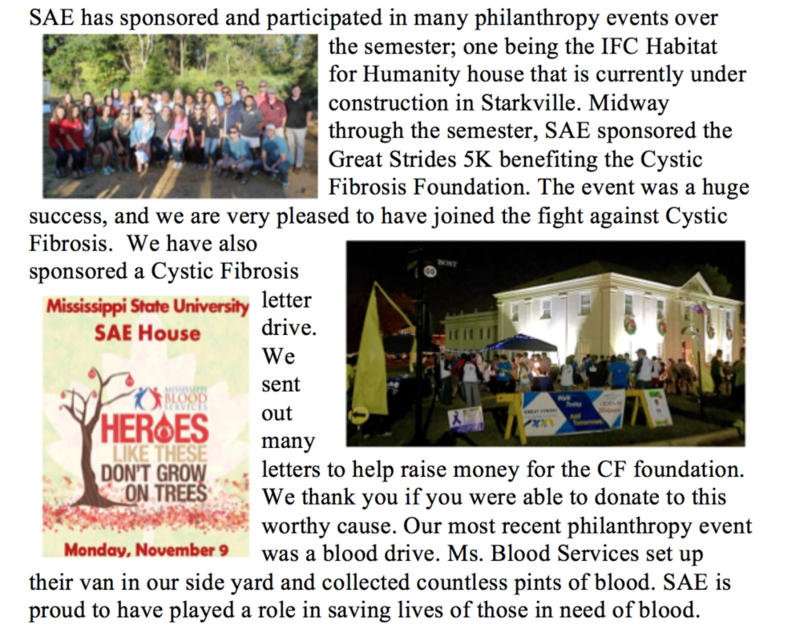 Highway cleanups, working on Habitat Houses, and putting together campus-wide events are just a few things that are a part of SAE's community Service. Members also host a dodgeball tournament that benefits the Palmer Home for children. Last year, the members of Sigma Alpha Epsilon hosted a showing of Darius Goes West. Darius and his whole crew came to the showing and spoke to the audience afterwords. In the following weeks, members wrote hand written lettesr to each chapter of SAE encouraging them to host a showing of their own. For more information on Darius Goes West visit the website here. The following is a Blog Post made by Darius and his crew. In the final stretch of our first three-week stint on the road, Darius and crew went to Starkville, Mississippi, for a screening organized by Reid Stribling, Justin Bell, Taylor Butler, the SAE fraternity, CAB, and the general Greek community at Mississippi State University. The hospitality was incredible! When we pulled into town, Reid met up with us and took us to a great restaurant for a late dinner. At the restaurant, we got to hang out with some super-models pictured above. The screening took place the next day at the venerable Lee Hall Theater, shown here in the background. After lunch at a Mississippi State dining hall, our hosts took us on a brief tour of campus. Then we got to eat at Mug Shots, a Starkville institution. Sam Montgomery, the manager at Mug Shots, gave us a free meal before the show, and afterwards he opened up the downstairs bar exclusively for Darius, the crew, and our new MSU friends. You can tell the food’s great because in the picture, for the first time on the trip, no one is talking. Thanks, Sam! The screening itself was HUGE! Because of great organizing from Reid, Justin, Taylor, Dejanae Banks (CAB), and others, volunteer ushers actually had to turn away more than two hundred people! We’re sorry that so many folks didn’t get a chance to see the film, but it’s a testament to MSU’s community organizing capabilities. Plus, a lot of the folks who couldn’t come in bought DVDs, so they’ll still be able to enjoy Darius Goes West. The 1,100-capacity theater overflowed with viewers. Some people even chose to stand in the back and watch! Here, Taylor Butler introduces the film to the largest Darius Goes West audience ever! You can’t even see Darius entering the arena through the thunderous ovation he received after the film. Everyone stuck around for a marathon Q & A, in which Darius was asked if he was single more than once. Here’s a picture of the crowd giving Darius and the gang one last standing ovation at the end of the question-and-answer –from the second balcony! What a great venue and a great audience! At the end of the night, Darius said that Starkville definitely stood out as one of his very favorite screenings. It couldn’t have happened without help from folks like Reid (in the plaid shirt to the right of Darius), Justin Bell in Goslabi green (bottom left), Georgia Wise, the SAE house Mom (purchaser of TWO miniature RVs! ), and the rest of the guys from SAE fraternity. CAB, MSU’s Campus Activities Board, was also instrumental in organizing this incredibly successful event. Thank you so much, Bulldogs!